Skills and abilities: Skilled animal tamer and trainer also skilled gymnast. Powers: None. 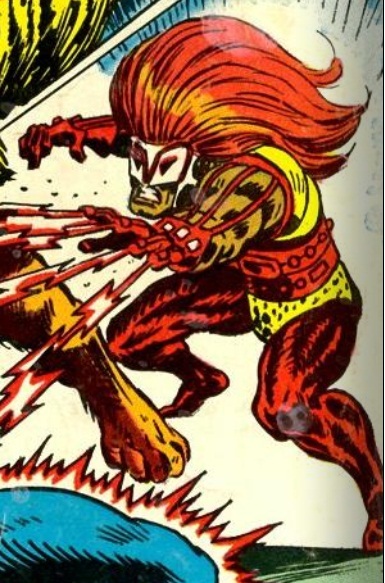 Uses technology to control felines such as Lions and Panthers to do his bidding, he also has a wrist mounted blaster capable of concussive force. Lion Fang was an early foe of Luke Cage before his partnership with Iron Fist. He attacked Luke and they did battle, almost evenly matched while inside what appeared to be a circus tent. When he attempted to flee when defeat was upon him he climbed a high beam. Luke was enraged and knocked said beam over resulting in Lion Fang falling and critically injuring himself. He didn’t die however as he showed up in The New Avengers: Luke Cage “A Town Without Pity” limited series from 2010 during the Dark Reign period. He was in a wheelchair; a result of the aforementioned incident with the high beam; and was going by the name Alexander Comillo, an enforcer for Drug Dealers in Philly.